What is Chronic Lyme Disease? - Dr. Andrew Dahlgren M.D. Like Chronic Fatigue and Immune Dysfunction Syndrome (CFIDS) and Fibromyalgia (FMS), Chronic Lyme Disease is a diagnosis that is fraught with controversy. Considered idiopathic (meaning the origin or cause is uncertain), Chronic Lyme Disease symptoms are many and varied, and the designation describes three subsets of individuals. One subset of individuals with Chronic Lyme Disease are those people who contracted Lyme disease from a tick bite, and who were never diagnosed or treated. This occurs because Lyme disease is difficult to diagnose due to the lack of reliable laboratory tests for it. Physicians have to rely on patients reporting a tick bite, the development of a bull’s eye rash, various symptoms, or newly reported joint pain. The bull’s eye rash, or erythema migrans, is a very definitive symptom of Lyme disease. It is a flat, red ring of rash on the skin that is present in 70-80 percent of person infected with Lyme disease. It first appears from 3 to 30 days after a tick bite, and can get as large across as 12 inches. Occasionally a bit warm, it rarely itches or is painful. It gets its name due to the fact that the middle area often clears, showing a white area that resembles a target or bull’s eye. Dizziness, shortness of breath, and short-term memory problems. A second subset of Chronic Lyme Disease sufferers are people who were treated for Lyme disease and either never got better or had symptoms return. Researcher J. N. Aucott, et. al. reviewed 63 patients who were treated for Lyme disease and found that 36% of them had their symptoms return after being treated for Lyme disease. This group is referred to as having post-treatment Lyme disease syndrome (PTLDS). The Centers for Disease Control (CDC) estimates that between 10-20 percent of people treated for Lyme disease fall into this category. Another group of people are bitten by a tick, show no symptoms for long periods of time, and then develop mysterious symptoms that are believed to be connected with the original tick bite. Theories abound regarding the origin of Lyme disease. In 2012, a team of researchers who were working to determine the genetic blueprint of a mummy found almost 30 years ago preserved in the ice in the Alps found evidence of the bacterium responsible for Lyme disease in the mummy’s tissues. The mummy was over 5,300 years old. Other theories say Lyme disease originated in Germany in the 1880s, France in 1920, the US during the Great Depression, and in Lyme, Connecticut in 1975. In 1977, Allan Steere, a Yale doctor, published a scientific paper about the known cases in Connecticut and dubbed the constellation of symptoms Lyme disease. 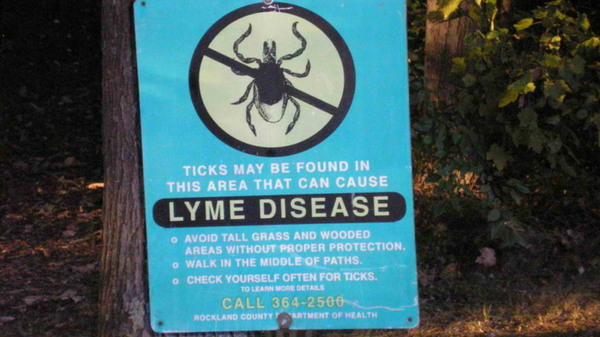 One theory surrounding the outbreak of similar symptoms (later called Lyme disease) among 39 children in Lyme, Connecticut says that the origin of Lyme disease was due to an accidental release of ticks being experimented on at Plum Island Animal Disease Center. The government denies that any ticks were accidentally release from this defense research facility located 8 mile south of Lyme, Connecticut. Despite the controversy surrounding where it originated and the idiopathic nature of it, Chronic Lyme disease is real.